Free download SoftPerfect Network Scanner latest version using the direct download link. 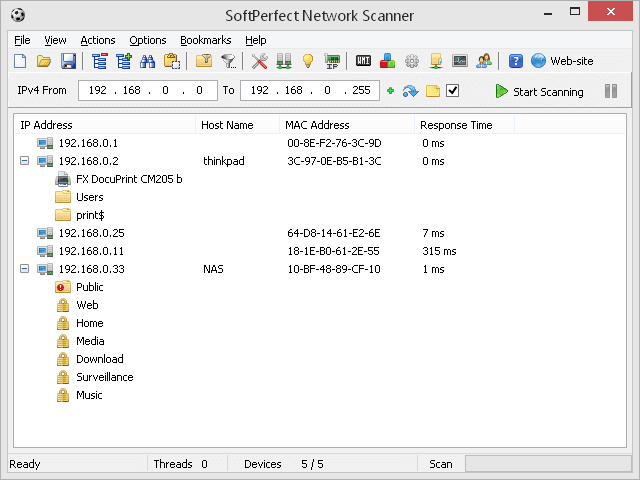 SoftPerfect Network Scanner is a free multi-threaded IPv4/IPv6 scanner with a modern interface and many advanced features. It is intended for both system administrators and general users interested in computer security. The program pings computers, scans for listening TCP/UDP ports and discovers shared folders, including system and hidden ones. In addition, it can can retrieve practically any information about network computers via WMI, SNMP, HTTP, NetBios and a bunch of other features. It can also resolve host names and auto-detect the local and external IP address range. To assist with network administration, it supports remote shutdown and Wake-On-LAN. Pings computers and displays those alive. Fully supports both IPv4 and IPv6 discovery. Detects hardware MAC-addresses, even across routers. Detects hidden shared folders and writable ones. Scans for listening TCP ports, some UDP and SNMP services. Retrieves currently logged-on users, configured user accounts, uptime, etc. Mounts and explores network resources. Launches external third party applications. Exports results to HTML, XML, CSV and TXT. Retrieves any system information via WMI, remote registry, file system and service manager. Absolutely free, requires no installation, and does not contain any adware, spyware or malware. Download the latest version of this software now from the link given below.